There is a nice little family-run trattoria in the village of Domus de Maria, than I highly recommend: Trattoria da Angelo. Everything here is homemade! In the kitchen, Angelo and his wife proudly prepare everyday the best of what the sea nearby can bring, while their son is front of house. There is no written menu and suggestions be made right at your table. Their cooking style is simple, tasty and very true to the island. We usually like to start our meal with a selection of fish and seafood antipasti, such as the amazing tuna and sword fish carpaccio, raw prawns as nature created them and a few broiled mussels. Next comes the fregola (kind of coarse couscous) with clams and garlic, their fabulous spaghetti with sea urchins or the risotto alla pescatora (or fisherman’s style). 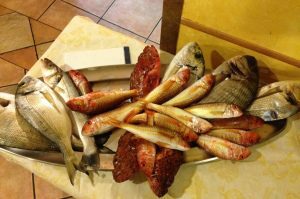 Don’t miss the catch of the day on display and ask the waiter to prepare your favorite fish either on the grill, in the oven with Vernaccia (Sardinian white wine) or Catalan style. A dry white Sardinian wine such as Vermentino will perfectly complement your fish-based meal.To conclude, why not try their homemade sebada or a refreshing sorbetto al limone (liquid lemon sorbet)? Trattoria da Angelo is open evenings from March to mid-November. It is very popular with both locals and tourists and very often fully booked in the Summer months. So, secure your table and book early! Note: The place is in the center of the village (via Isonzo 3), but hiding a bit. Don’t hesitate to ask somebody to show you how to get there.